On 15 June 2010, Varna Free University was the only one of many Bulgarian ECTS Label candidates to successfully pass all selection stages. The procedure was held with participation by independent experts in order to guarantee the comprehensiveness of evaluation results. After a joint hearing between the European Commission and the European Executive Agency, the latter reached a definitive decision to award the DS и ECTS labels to Varna Free University. The European Credit Transfer and Accumulation System (ECTS) is used throughout Europe to enhance the cooperation between universities as a means to improve educational quality for the benefit of students and higher education institutions, student mobility opportunities being of dominant significance. The ECTS was established by the European Committee for the purpose of providing general procedures guaranteeing international higher education recognition. 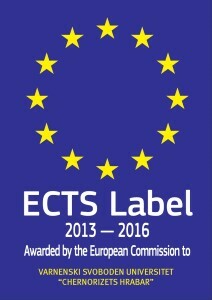 The ECTS Label is awarded to institutions with significant success in applying the European Credit Transfer and Accumulation System (ECTS) in B.A. and M.A. education. 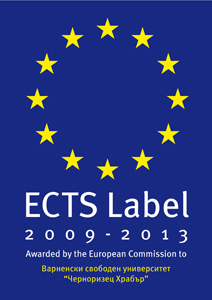 The ECTS Label gives awarded institutions greater prestige, making them dependable and trustworthy partners in European and international cooperation. All distinctive 2010 candidates received their ECTS and DS labels in the presence of European Commission and EACEA representatives. In 2013 Varna Free University “Chernorizets Hrabar” passed successfully the selection and audit procedures of the Education Audiovisual and Culture Executive Agency, and was awarded for a second time the ECTS Label for successful application of the European Credit Transfer and Accumulation System. At an official ceremony held in Brussels 11 June 2009, Mr. Jan Figel, a member of the European Commission, presented a European Diploma Supplement Label to Varna Free University’s Rector, Professor Anna Nedyalkova. The event was also attended by Ms. Odile Quintin, Director-General DG Education and Culture, European Commission. 65 higher education institutions of 16 different countries have so far been awarded a special European Quality Label as a recognition of their efforts to make international education more accessible. 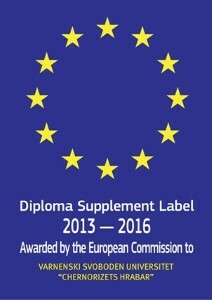 The distinctive labels are awarded to universities for the successful implementation of the European Credit Transfer and Accumulation System and the issuance of diploma supplements (DS). Out of 63 applications submitted under the European Credit Transfer and Accumulation System, 23 higher education institutions have been awarded a distinctive label. Out of 161 Diploma Supplement applications filed, 52 universities have received a DS Label, while only 10 universities have received both. Out of all 2009–2013 Bulgarian DS and ECTS candidates, a DS Label was awarded to Varna Free University alo. The procedure was held in the presence of independent experts in order to guarantee the comprehensiveness of evaluation results. After a joint hearing between the European Commission and the European Executive Agency, the latter reached a definitive decision to award the DS и ECTS labels to Varna Free University. 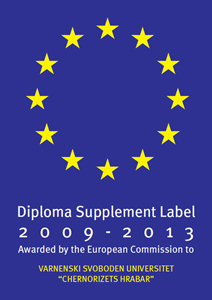 DS Labels are awarded to institutions providing European Diploma Supplements to B.A. and M.A. graduates in conformity with the standards established by EC, the Council of Europe and UNESCO. The DS Label is a guarantee for educational quality. The European Diploma Supplement has a key priority in the implementation of the Bologna Process. It is a document attached to a graduate’s higher education diploma for the purpose of improving the international transparency and facilitating the recognition of academic and professional qualifications (diplomas, degrees, certificates, etc.). A DS does not provide evaluation of the quality of education, as it does not contain any statement concerning equivalence or recognition. A diploma supplement is a flexible instrument without prescriptive character, which rather serves the saving of time, money and efforts by providing opportunities for easier qualification recognition by employers and foreign universities – a requisite for a successful career start. In 2013 Varna Free University “Chernorizets Hrabar” passed successfully the selection and audit procedures of the Education Audiovisual and Culture Executive Agency, and was awarded for a second time the DS Label for recognition of learning by issuing the European diploma supplement. The Diploma Supplement is issued in a widely spoken European language, provided automatically and free of charge to every student upon graduation.